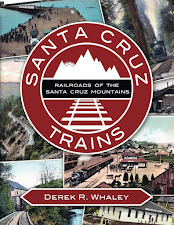 Santa Cruz County did not simply develop because of the railroad. It was the effort of individual people who helped turn a small, isolated county on the northern fringe of the Monterey Bay into a tourism Mecca. One such individual was Thomas L. Bell. The origins and ultimate fate of Thomas Bell are not well know. He first entered the local scene in the 1880s as the superintendent of the Pacific Manufacturing Company mill that sat midway between Felton and Boulder Creek. His boss, James Pieronnet Pierce, was a forward-thinking man who also understood public relations. When the Felton & Pescadero Railroad first passed through the mill in 1884, Pierce saw the end of logging in the area and the birth of a town. 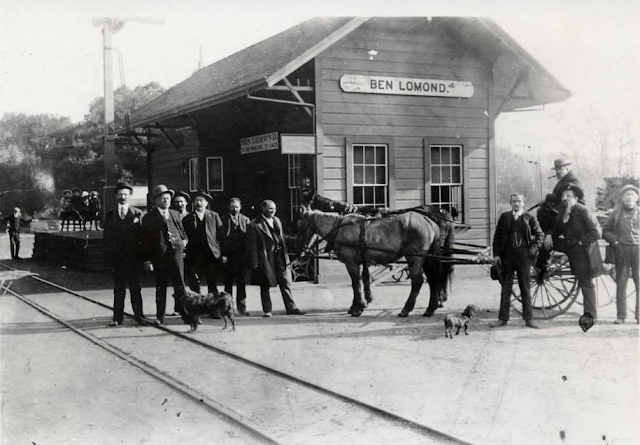 Ben Lomond depot during a major event, c. 1895. 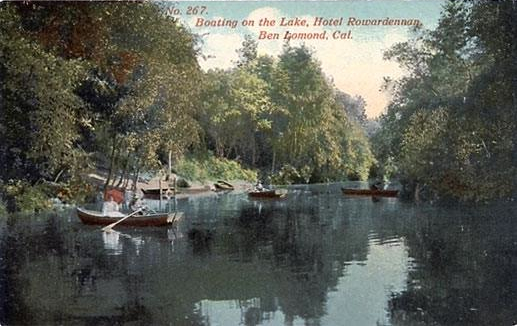 In 1891, the area around the confluence of Love Creek into the San Lorenzo River was logged out and Ben Lomond transitioned completely to a tourist town. On the northwest side of town, Bell constructed the Hotel Ben Lomond as the first tourism-specific venture in town. Pierce, meanwhile, built a mansion he named Hillside, visible from throughout the town, to showcase the benefits of building summer cottages in this region of the San Lorenzo Valley. But neither of these were quite enough. The town required something grander. Bell Lake behind Hotel Rowardennan in Ben Lomond, c. 1900. Bell founded the Ben Lomond Improvement Company in 1896 alongside his wife, Weltha A. Bell, and his son, William. The purpose of this new company was to construct a fabulous 300-acre resort just south of Ben Lomond along the county road. Bell took the lead on this project and accepted Southern Pacific Railroad money to help fund it. Hotel Rowardennan opened in the summer of 1896. It spared no expense to attract people. The property included tennis courts, a campground, forest paths, and an artificial boating lake named "Lake Bell," created by damming the San Lorenzo River. The dam also generated power for the hotel, which featured dozens of electric lights. Hotel Rowardennan from the front, Ben Lomond, c. 1900. The original structure burned to the ground in February 1897, but Bell rebuilt quickly and the project continued to grow. The second structure included, among other amenities, a large restaurant, a dance hall, billiards room, and a telegraph office. Hotel Ben Lomond, on the other side of town, attempted to match Hotel Rowardennan feature-for-feature. But the latter was always the more refined, catering only to the elite and even denying stays to those management deemed disreputable, including Jews. Competition with Hotel Ben Lomond and other local ventures cut into his profit and he decided to move onto his next project. In 1899, he sold Hotel Rowardennan to H. Francis Anderson, who hired Benjamin and Gertrude Dickinson to run the hotel. In later years, they would also found the adjacent Hotel Dickinson. Anderson renamed the hotel Ben Lomond Lodge in the 1920s, and the resort burned to the ground on April 9, 1932. The detached ballroom burned the next year. All that remains of this facility is the concrete fountain that still welcomes people to Ben Lomond. A series of fortuitous transactions brought Thomas and Weltha Bell to their next project. Frederick A. Hihn, who had worked with Pierce at various times, had acquired title to a large tract of land at the confluence of Bean and Zayante Creeks on the site of Isaac Graham's original lumber mill. Desiring to put this prime real estate to use, Hihn sold or leased the land to the Bell, who founded the Arcadia Development Company in 1898. He moved fast, converting the large meadow beside the railroad tracks into a small cottage city. Like he did in Ben Lomond, Bell dammed Zayante Creek, thereby creating a boating pond that doubled as a source of power for 200 lights strung throughout the campground. He also built an outdoor dancing pavilion and tent dining room. He named his new resort Arcadia, a reference to Ancient Greece. 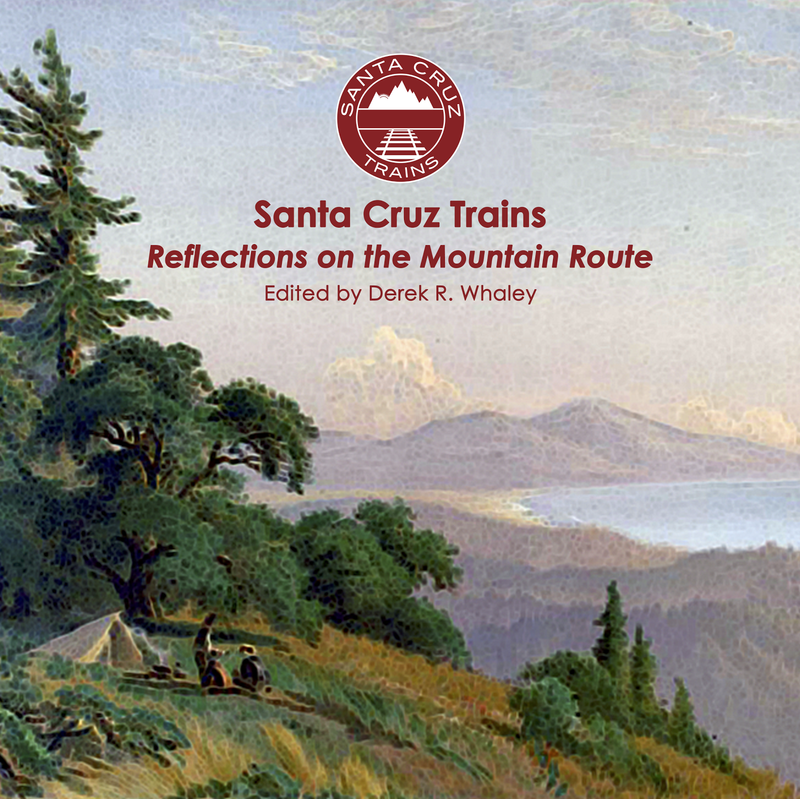 Following up the Zayante Creek a few hundred yards, above the depot, I saw a large sign which read: "Campus Station." Under this is the name of the hotel and grounds, which is Arcadia, and it all belongs to and is conducted by Thomas L. Bell and his wife. It is conducted on the hotel plan. I went all over the place and found a large dining-room and kitchen, a large fine ball-room and electric light plant. The plant is a 12 horse-power engine, and furnishes 200 lights, which are sufficient to light up all the rooms and ground. The sleeping apartments are in cottages of from two to four rooms each. There are 25 of these cottages, and all furnished in the most comfortable manner. About 100 feet below the office, on the Zayante Creek, is a beautiful lake, formed by a dam thrown across the creek. On this is three boats for pleasure riding. Just on the opposite side Bean Creek dashes down over a fall about 40 feet, and joins Zayante. The whole place, the creek and the dam, are in a fine grove of redwood, pine, oak and madrona Mr. Bell intends, before another season, to plough, scrape and level down all the plaza-like grounds between the grove and the railroad tracks, and will erect a large, central building, which will be the hotel proper. Bell ran into problems, though, when he petitioned the railroad for a stop there. The station was initially known simply as Campus, pending a better name. However, Arcadia already existed in the Southern Pacific network and the railroad did not want yet another duplicate name. 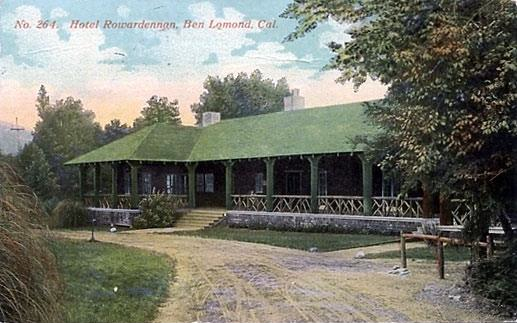 After some research, Bell renamed the resort Tuxedo, after Edward Henry Harriman's park in New York state. To match this new grandeur, Bell built the two-story Tuxedo Inn in 1901 and petitioned the railroad to built a formal depot structure alongside the tracks in 1903. Tuxedo proved to be the peak of Santa Cruz County resort culture, but Bell was already looking elsewhere. On December 12, 1905, Bell finalized the sale of Tuxedo to the Mount Hermon Association for $45,300. The F.A. Hihn Company finalized the sale of the property and its water rights in March the next year. Why precisely Bell and Hihn decided to sell the resort less than a decade after founding it is unclear. The resort had picked up an unsavory reputation in a short matter of time, so Mount Hermon renamed it the "Zayante Inn" in April 1906. Liquor sales and gambling tables, for which the hotel was infamous, quietly were discontinued. The railroad stop was renamed Mount Hermon in 1907 and the site has served as Redwood Camp since the 1960s. Thomas and Weltha's final known project in Santa Cruz County was less audacious than their previous two. In 1906, they founded the Artesia Development Company and once again purchased or leased lands from Frederick Hihn. In May 1907, a subdivision plat was filed with the county records showing the Tanglewood subdivision in south Felton located on either side of San Lorenzo Avenue. The couple named the settlement after Nathaniel Hawthorne's book, Tanglewood Tales for Boys and Girls, published in 1853. When the old narrow-gauge tracks of the South Pacific Coast Railway were removed in 1909, the subdivision spread out further, both up the hill and to either side, eventually encompassing everything between Gold Gulch and Shingle Mill Creek. William L. Bell, Thomas and Weltha's son, continued to oversee property sales for the next decade. He had been appointed a surgeon on the US Navy ship Independence in 1898 during the Spanish-Amrican War, and he also served in World War I in the same capacity. By 1912, he was divorced and had at least one child. In 1948, he became a doctor in Felton, where he could also oversee the estate of his parents. When Thomas and Weltha abandoned Tanglewood is unknown, but they disappear from newspaper records after 1911. 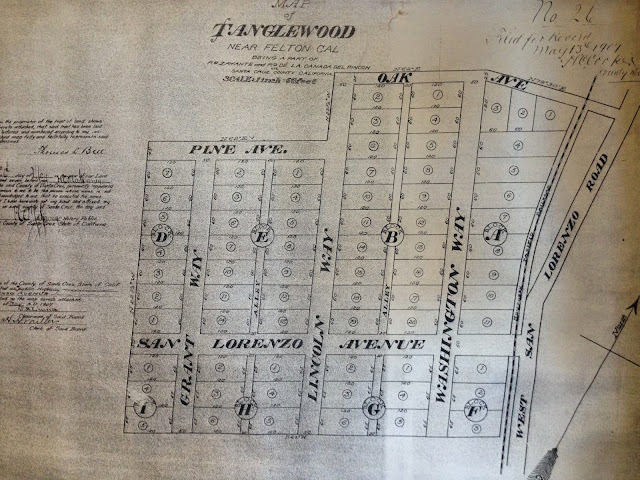 Tanglewood, meanwhile, hosted two gas stations, a maintenance shop, a market, and a restaurant through the 1960s, but declined as a commercial area afterwards. Today, it hosts Cowboy Diner and Felton Guild, as well as the Big Foot Discovery Museum, but is otherwise just a residential subdivision. Brown, Randall C. "Ben Lomond Is Lit Up." Press-Banner, 18 December 2015. Brown, Randall C. "The Dammed River: Mr. Pierce's Neighborhood." Press-Banner, 16 July 2015. Brown, Randall C. "Fishy Transactions." Press-Banner, 6 August 2015. Brown, Randall C. "The Magnificent Andersons." Press-Banner, 19 October 2015. Brown, Randall C. "The Right Side of the Tracks." Press-Banner, 23 July 2015. Morrow, John. "John Morrow's Letter." Evening Sentinel, 8 September 1900, 3:5. "Pacific Winona will be located at Tuxedo—Hihn Co.'s Terms are met." Evening Sentinel, 16 February 1906, 1:5. San Francisco Call, 7 February 1897, 4:4.